(York, Pa., March 21, 2018) - The York Revolution have added three more players to their 2018 roster, with the additions of right-handed pitcher Matt Stites, outfielder Travis Witherspoon, and right-handed pitcher Joe Van Meter. The signings were unveiled by manager Mark Mason live on Tuesday night’s episode of “Revs Hot Stove Weekly presented by Shipley Energy” on SportsRadio 1350 WOYK. Stites joins the Revs after spending the past seven seasons in affiliated ball, including parts of two seasons in the Major Leagues with the Arizona Diamondbacks. The 27-year-old logged 41.2 innings over 48 combined appearances for Arizona in 2014 and 2015, striking out 32 batters. 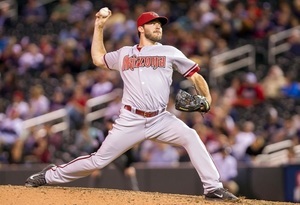 Stites spent the 2016 season between Triple-A and Double-A in the Diamondbacks system, posting a 5-2 record with a 2.75 ERA in a career-high 52.1 innings, and added 27.1 innings at Triple-A in 2017. Stites was drafted in the 33rd round of the 2010 MLB draft by the Chicago Cubs but didn’t sign. He significantly improved his draft stock and became a 17th round pick of the San Diego Padres in 2011, pitching the first three years of his career within the Padres organization. Witherspoon returns to York after an excellent 2017 season in which he batted .275 with 48 RBI and 68 runs scored in a team-high 126 games. The speedy outfielder racked up 19 stolen bases and moved into third all-time on the Revolution career stolen-base list with 53, while also collecting 32 extra-base hits, including a team-high seven triples to lead the team. Witherspoon was an Atlantic League All-Star selection for the second straight season and started in center field and in the leadoff spot for the Freedom division. Witherspoon was originally acquired in a trade with the Lancaster Barnstormers in 2016 and hit .293 in 81 games with York. The South Carolina native was a 12th round pick of the Los Angeles Angels in the 2009 MLB Draft. “It’s really nice to have ‘Spoon’ back. We know defensively he’s as good as anybody in the league, if not the best in the league in center field. He does a great job. He can play anywhere in the outfield that we need him to play. He’s just been a solid everyday guy. He wants to play every day. He plays the game hard,” Mason said. Van Meter joins the list of returning Revs’ pitchers after working 63.0 innings in 55 games in 2017. The right-hander went 4-2 with a 2.57 ERA and 64 strikeouts while only allowing 45 hits on the season. He recorded one save, and all but one of his appearances were out of the bullpen. Van Meter pitched more than one inning in 13 outings and went 18 straight appearances without allowing an earned run from July 1 through August 18. In 2016, he pitched in nine games for the Southern Maryland Blue Crabs, and he spent the 2014 and 2015 seasons in the American Association. Van Meter was drafted by the Texas Rangers in the 21st round of the 2010 MLB Draft out of Virginia Commonwealth University and spent parts of four seasons in their farm system. He has also pitched in the Tampa Bay Rays’ and Baltimore Orioles’ systems. The Revs now have 21 players under contract for the 2018 season and will unveil additional signings on the next episode of “Revs Hot Stove Weekly presented by Shipley Energy” on Tuesday, March 27, at 6:30 p.m. immediately following “The Baltimore Baseball Show with Dan Connolly” on SportsRadio 1350 WOYK and www.woyk1350.com.